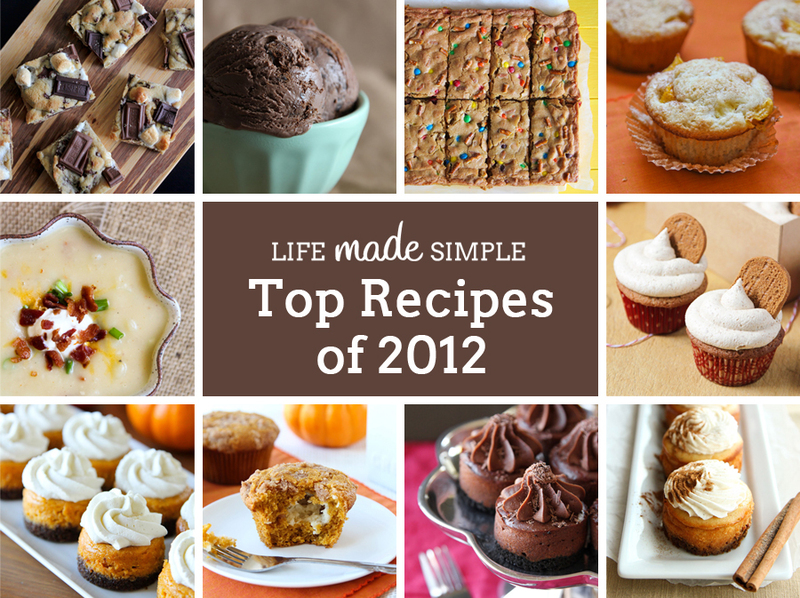 Top 10 Recipes of 2012 - Hi, friend Popular Recipes, in this article entitled Top 10 Recipes of 2012, we have prepared this article well and concise to be easy to understand for you to read and can be taken inside information. hopefully the contents of the post Article 2012, Article blogging, Article new year, Article recipe round-up, Article Top 10 Recipes, that we write this you can understand and useful. okay, happy reading. 1. 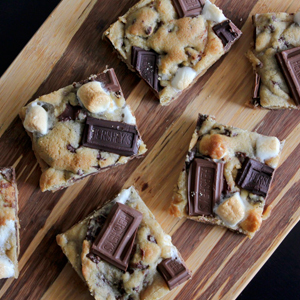 Graham Cracker S'mores Bars: Back in February I decided it was time to get into the kitchen and spend a little time doing something I love- baking! I made a big ole sheet of these bars for the youth at our church and everyone was smitten! When I posted this recipe I had no idea just how many people would try them and how much feedback I'd get. It really shaped what Life Made Simple would be for the remainder of the year. 2. 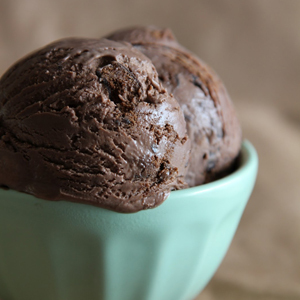 Chocolate Thin Mint Ice Cream: When Stephen and I spent the weekend at his parents house I tried Girl Scout cookies for the first time. My favorite? Thin Mints. It was love at first bite. I saved a sleeve and brought them back home. I broke out my ice cream attachment for my KitchenAid and made this ice cream. To this day it's still my favorite homemade ice cream! 3. Sweet and Salty M&M Pretzel Bars: I took a little trip to Barnes & Noble to do some research. I was looking for a cookbook that I could use day in and day out. 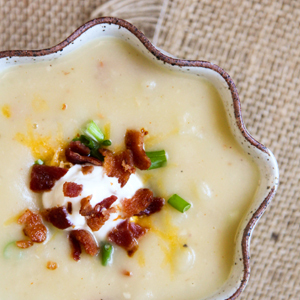 Something with both savory and sweet recipes in it that were tried and true. That's when I came across the Cook's Illustrated New Best Recipe book. It's amazing! Every recipe in there is awesome! 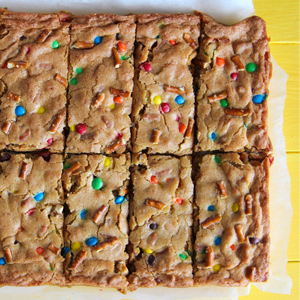 I used their blondie recipe as the base for these bars. 4. 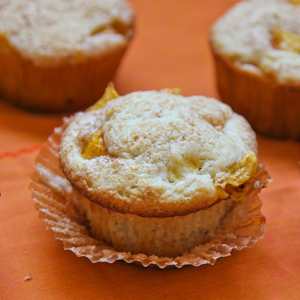 Peach Cobbler Muffins: During the beginning of summer when peaches were abundant, I decided to make muffins. I used the extra mushy ones and crossed my fingers that all would turn out well- and it did! They were perfect! 6. 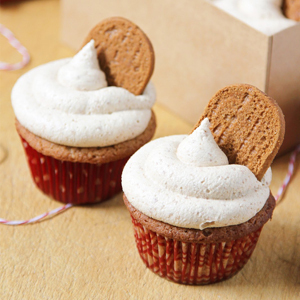 Biscoff Gourmet Cupcakes: Oh Biscoff- how I love you! This summer I purchased 2 jars of Biscoff spread. They didn't last long. What can I say? It's divine. I added some to my cupcake batter and beat some into the frosting. These cupcakes lasted about as long as the spread- gone in the blink of an eye. 7. 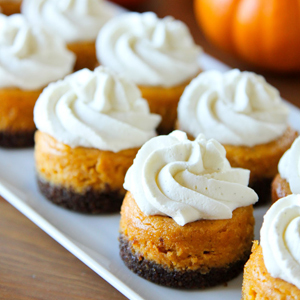 Mini Pumpkin Cheesecakes: As soon as the weather started to cool off I stocked up on pumpkin puree, 10 cans or so. These cheesecakes were the first thing I made. When I posted the recipe on here I had no idea just how popular they'd be. The emails came flooding in, people were pinning it like crazy and everyone wanted to know where I got my mini cheesecake pan from (you can buy it here). Needless to say they were a hit both online and at home! 8. 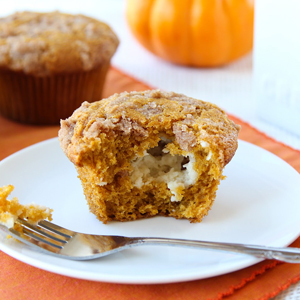 Pumpkin Muffins with Cinnamon Cream Cheese Filling: Muffins are always a huge hit no matter what time of day they're made. It was 3:00 in the afternoon when I decided to whip up a batch of these beauties. I had cream cheese left over from making mini cheesecakes so I decided to place a dollop inside the center of the batter. 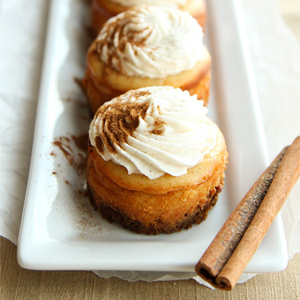 I topped them with cinnamon sugar flakes and tossed them in the oven. The house smelled heavenly and as soon as they came out of the oven I gobbled one up. They've certainly become a favorite, something I'll make time and time again! 9. 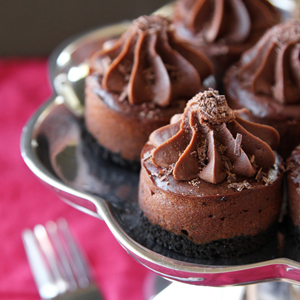 Mini Chocolate Raspberry Cheesecakes: The week of Thanksgiving was hectic. I was working a ton and had little time to prepare for the big day. I knew I was going to make my mom's apple pie, but I wanted another dessert to serve. Stephen suggested chocolate raspberry cheesecake so to cut down on prep/baking time I adapted a recipe to fit into my mini cheesecake pan. I sunk a whole raspberry into the center of each for a little surprise. He loved them and I did too! Thank You and Good article Top 10 Recipes of 2012 this time, hopefully can benefit for you all. see you in other article postings.